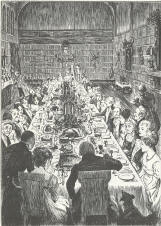 Each year, well most years actually, the DCC holds an Annual Dinner to which members and guests are invited. It is often the only time of the year that partners of members get together and it has been to many venues over the years. Unlike some clubs (e.g. 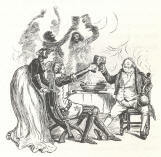 venerable Buxton ones), we have not had to move on from place to place because of our behaviour but we have changed the venue over the years looking for a reasonably priced meal but convivial surroundings. A list of venues since 1980 can be read below. Some people ask about dress code. Many members will dress up (dinner jackets for the men) but this is not obligatory. 'Clean' is the only real requirement but if you like to dress smart from time to time, this is an opportunity. PLEASE NOTE that while we welcome members of other clubs and guests of our members, we reserve the right to refuse to sell tickets if we consider that the applicant would not be welcome at the dinner. The Annual Dinner is on 10th November 2018 at Bramhall Golf Club. The booking system is open and bookings can be made up until midnight on 28th October 2018. Don't miss out on the social highlight of the Club year. Bookings can be made by following this link (members only). Non-members can contact the Club by emailing to the organisers. The last few dinners are described below. The awards for previous years can be read at this link. Going upmarket a bit, the Dinner and Dance was held on Saturday, 10th November at Bramhall Golf Club. The venue provided a really good three-course dinner which was followed by the awards, presented by Anton, and a Disco. There was a good selection of photos on display. The Dinner and Dance was held on Saturday, 25th November at the Stockport County Football Ground. It was on the same lines as previous years with a sit-down dinner followed by the awards (Caver of the Year and so on) and a Disco. 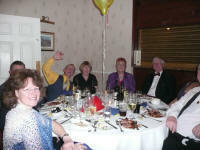 The dinner and 'dance' was held at Stockport Masonic Guild Hall as in previous years. It was a three-course meal with wine on the tables followed by music from a live band - The Fuse. A very successful dinner and 'dance' was held at the De Vere hotel at Cheadle. The three course menu included a carvery for the main course. Ask Joel about Christmas decorations! This dinner was at the more traditional time of year at the end of November. As a break with recent tradition, we went to the Cheshire Suite at Stockport County Football ground. 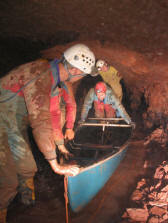 The awards this year included Anton Petho as Caver of the Year. There was a good turnout with a great mix of younger members, older members and guests from other clubs. Everyone enjoyed a superb meal and the disco provided by Paul Dold and Ed, guests from the deep South. The photos displayed by members in particular showed how much had been going on since the last dinner. This dinner took place on June 15th, 2013 at the Guildhall again. It replaced the traditional 2012 and 2013 November dinners. The awards were given out to various people including Lauren Griffin as Caver of the Year. 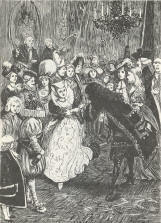 The turnout was lower than recently because of the time of year and clash with other events in Buxton. Nevertheless, a good time was had by all with the music provided by a live band. The dinner was held on 26th November 2011 at the Masonic Guildhall, Stockport. An excellent dinner was held at the Old Rectory Hotel in Haughton Green, Denton. 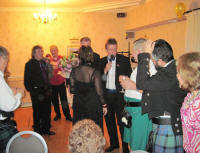 All the organising was done by Sue and Tony with speeches by John New and AG. The venue was really good with the hotel to ourselves. A number of members stayed overnight. Because of pressure of time, the Club awards were not presented after the dinner but were presented at the AGM on 13th December. If you were not there, then I am sorry to say that you missed a really good night out in the company of more than 100 members, ex-members, guests and friends. The awards this year went to Nigel for Caver of the Half Century (well slightly less actually), Len, Geoff and Bill for Digger of the year, Ed for Mighty Miner and Liz for Tolerance (putting up with Nigel). There are more pictures in an album. The 2009 Dinner was held at The Coach and Four, Wilmslow. There was a short talk by our retiring Chairman and our guest speaker. Tony got the digging award this year and the Club awarded itself the Tolerance Award for putting up with Simon for so long. 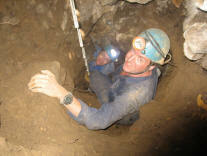 Caver of the Year was not presented this time. The 2007 dinner is past history now. However, if you heard some foul rumours about bad taste competitions, then you heard correctly. Thanks to Sue, we had the Guess-The-Bottom competition, a copy of which can be downloaded on the Club pages. We also had a photo competition with five entries and Simon won because of his superb Alum Pot photos (see our Home Page or caving gallery for example). Awards were given to Tony Brocklebank for Caver of the Year bearing in mind his support in many ways and not least his contribution to new finds at Matienzo; Phill and Elaine Taylor for Mighty Miner because of their work in Tom's Shaft and looking after the museum; Simon Dillon (again!) for Digger following successes in Matienzo; and Steve for Stunt based on his violin playing and his canoe in the Hough Level. Sarah Berry got a much deserved Tolerance Award after Allan told her he was only going to be away a week when he went to Matienzo with Simon for a fortnight.